Jesus Christ and His disciples were under considerable pressure. The hostility of the Jews had intensified. Hence, the Master and His men withdrew into the borders of Tyre and Sidon (in Phoenicia) to the northwest of Canaan. With such a tribute from the Son of God, surely we want to know more about this good lady. The record is found in Matthew 15:21-28, and in a parallel account in Mark 7:24-30. While in the Syrophoenician region, Jesus entered into a certain house where He hoped He might enjoy some privacy, but, significantly, “He could not be hid” (cf. Mk. 7:24), because His message was too wonderful and His deeds too powerful to be concealed. His fame preceded Him everywhere He went. It was here that a heart-broken woman sought Him out. She was a Canaanite by origin, that is, she had pagan roots. The woman was sorely distressed due to the fact that she had a little daughter who was grievously tormented by a demon that possessed her body. In view of her plight, the anxious mother followed Christ and those accompanying Him. She pleaded that He might have mercy on her, and heal her daughter. Many feel the Lord’s treatment of her seems uncaring — almost harsh. That view is quite unfounded. A closer examination reveals that Christ knew the quality of this woman’s soul and He challenged it to mature. In a marvelously designed way, the Master Teacher placed several obstacles in the woman’s path, each of which she overcame with radiant faith. Finally, Jesus exclaimed: “O woman, great is your faith,” and He healed her daughter without so much as laying His eyes upon the child. It was another of the Lord’s “long distance” miracles (cf. Jn. 4:46ff). The expression “Son of David” has its roots in the Old Testament. The prophets had announced that the Messiah would descend from the royal lineage of David (2 Sam. 7:12-16; Isa. 11:1). Hence this noble woman had some information about the Old Testament and its predictions regarding the Christ. Three times in Matthew’s record, the Syrophoenician woman acknowledged Jesus as “Lord.” While it is true that the term kurios can be used as a common term of respect (cf. Jn. 4:11; 9:36), in this instance it clearly denotes an expression of religious devotion. She does not lightly use that term, “Lord,” as evidenced by the fact that she “fell down at His feet” and “worshiped Him” (Mk. 7:25; Mt. 15:25). She obviously believed in Christ’s miraculous power and His goodness for she asked for “mercy” in the form of a miracle (Mt. 15:22). Where had she learned of the Son of God? By word of mouth? Had she journeyed over into Galilee and watched Him from the crowds? These questions must remain unanswered. The fact is, she believed. Jesus once taught, “Ask, and it shall be given you; seek, and you shall find; knock, and it shall be opened unto you” (Mt. 7:7). The verbal forms denote continuous action, hence, persistence. This lovely lady understood that principle well for her faith was most tenacious. As suggested earlier, the Lord placed those little faith-building barriers in her way, but she conquered them all. This is clear evidence that Christ had divinely penetrating insight into the fiber of the woman’s soul. When she initially made her request for mercy, Jesus “answered her not a word” (Mt. 15:23). It would be a serious mistake to assume that the Savior’s silence evidenced a lack of concern. The disciples suggested that Christ hurriedly grant the woman’s request so that she would leave them alone. That this was the design of the disciples’ request is clearly implied by the nature of the Lord’s response. The Lord replied (doubtless in the woman’s hearing) that He was sent only to the lost sheep of the house of Israel — and that excluded this Gentile (Mt. 15:24). But she kept coming! “Let the children first be filled: for it is not proper to take the children’s bread and throw it to the little dogs” (Mk. 7:27). Many complain that the Lord used insulting language here, but the Greek term for “dogs” is diminutive, meaning a little pet puppy. The expression is not as harsh as the English would seem. “Yes, Lord, for even the little dogs get the children’s crumbs that fall from their master’s table” (Mt. 15:27; Mk. 7:28). She would be satisfied with but a crumb from her Master’s table. What a woman! She held on like a tick. 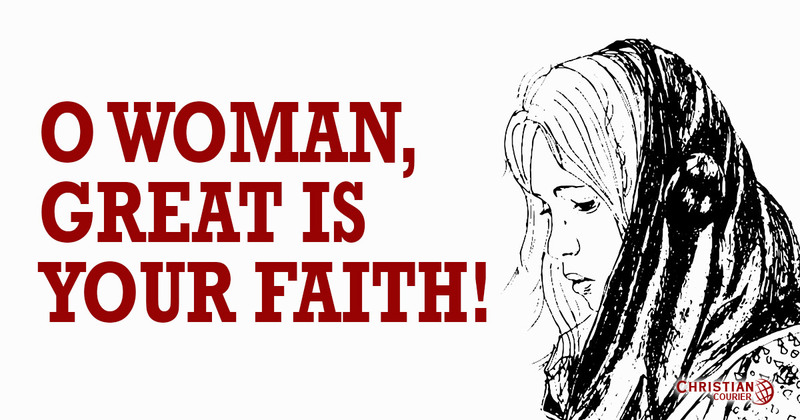 No wonder the Savior proclaimed her great faith! Although the Syrophoenician woman had cried to the Lord, “Have mercy on me,” (Mt. 15:22), her request was actually for her daughter. Her passion was so directed to the offspring of her flesh that she cast aside any personal need and plead for the welfare of her afflicted child. Such a sacrificial spirit is truly refreshing in a day when child abuse is such a common tragedy. This woman understood well the concept that faith without works is dead. Though she had been given no specific acts of obedience to perform, nevertheless, when Christ came into her region, she sought Him, pursued Him, worshiped Him, plead with Him, and reasoned with Him. Had she operated upon the premise that “so long as I believe it to be so, it will be,” her afflicted daughter would have remained in that woeful condition. It remains a firm truth that according to the New Testament record, no person was ever blessed on account of his or her personal faith until that faith expressed itself in action. “And Jesus seeing their faith saith unto the sick of palsy, Son, your sins are forgiven” (Mk. 2:5). Seeing their faith was equivalent to seeing their action. James challenges: “Show me your faith apart from your works” (Jas. 2:18). How sad it would have been had this dear woman reasoned within herself — “I am a Gentile, a mere woman of no reputation. Who am I to receive any blessing from the famed Nazarene?” She then would not have asked, and hence, would not have received! (cf. Jas. 4:2). This unnamed woman will inspire many for untold centuries. Her undaunted faith shines brilliantly from the gospel records. May we all be spiritual enough to learn the lessons that this thrilling narrative imparts. NOTE: Some have appealed to cases of this nature in an effort to prove that one can improvise his own worship system today. However, a spontaneous act of devotion during the earthly ministry of Jesus is neither a parallel nor justification for attempting to serve God under the New Covenant regime by means of “will-worship” (Col. 2:23). The Canaanite Woman: A Conflict between Matthew and Mark?